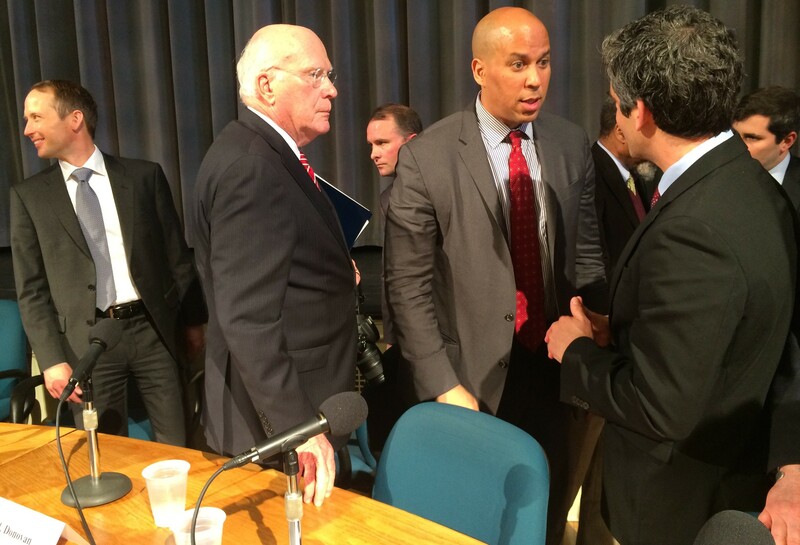 Sen. Cory Booker (D-N.J.) talks with Burlington Mayor Miro Weinberger as Sen. Patrick Leahy (D-Vt.) looks on. Sens. Patrick Leahy (D-Vt.) and Cory Booker (D-N.J.) touted their efforts to reduce incarceration and reform the criminal justice system during a forum at Burlington City Hall on Monday. The senators led a panel featuring Gov. Peter Shumlin, Chittenden County State’s Attorney T.J. Donovan, U.S. Attorney Eric Miller, Burlington Police Chief Brandon del Pozo, Burlington Mayor Miro Weinberger and others. Booker, a former mayor of Newark and a darling of the left, introduced a bill last year that would reexamine federal sentencing laws and reduce mandatory minimum sentences for nonviolent offenders. Leahy cosponsored the bill. Donovan, who is running unopposed to become Vermont’s attorney general, said prosecutors need to be more courageous in not filing criminal charges against everyone police arrest. Vermont’s prison population has dropped in the last year, to around 1,700 inmates. But it still stands 70 percent higher than it was in 1990, even though the violent crime rate has fallen around 30 percent in the same time frame, according to the Department of Corrections and federal statistics. Tougher sentences for drug and other non-violent crimes have fueled the inmate spike. The Department of Corrections doesn’t have enough prison space, and currently sends 230 inmates to a privately run prison in Michigan. The forum opened with Booker and Leahy showering praise on one another. Booker said he came to Burlington because “a man who I love invited me today,” and later called Leahy a “mountain of a man.” Booker, who has been touted as a potential vice presidential candidate, was scheduled to headline a fundraiser for Leahy’s reelection campaign Monday night. After the forum, Leahy and Booker were scheduled to tour Burlington’s King Street Center, which provides services to children and young families.